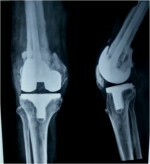 1Dept of Orthopaedics, Sarojini Naidu Medical College, Agra -282002, Uttar Pradesh, India. 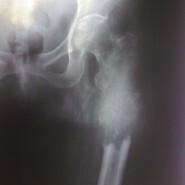 Introduction: Bone is the third most common site of metastatic disease. Treatment of metastatic tumours of proximal femur usually used to be either palliative in the form of radiotherapy and chemotherapy or a very radical in form of hemipelvectomy and hip disarticulation. Both forms of treatment were associated with dismal outcomes. Now with the technological advancement and refinement in surgeries a custom made hip prosthesis offers a much better treatment option to the surgeon and a good quality life to the patient. Case presentation: We are presenting a case of metastatic adenocarcinoma of upper end of left femur with pathological fracture with a small primary in right lung treated with custom made hip prosthesis. Patient received chemotherapy for primary lesion and is doing well at 11 months of follow up. Conclusion: This case is being presented on account of its unusual presentation and to give emphasis that in spite of metastatic disease, patient can be considered for limb salvage and megaprosthesis to improve his/her quality of life. This can be considered provided patient’s general condition permits and if only a single solitary metastasis is present.